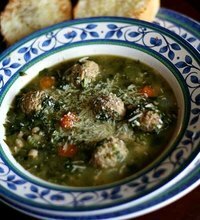 An Italian Wedding Soup involves the combination of green vegetables and meat, usually meatballs or sausage in a chicken broth. Sometimes it contains a pasta, chicken, and other vegetables such as onion, carrots and celery. There are many variations on this recipe which originally came from Italy, although the Italians do not call it an Italian Wedding Soup. That name comes from the fact that the greens and the meat in the soup go well together, which in Italian means "si maritano bene". Translated that means that the meat and greens are well married, meaning they go well together. Due to a bad translation the soup came to be known as a Wedding Soup in America. Below is my version of this wonderful and tasty soup. I hope you will enjoy it. Place the onion, parsley, basil, garlic, salt, pepper, bread crumbs, and parmesan cheese in a bowl and mix together. Next mix in the ground beef and the ground sausage into the bowl. Lastly mix in the lightly beaten eggs and thoroughly mix together. Now shape the meatballs into 1 inch in diameter meatballs. Set these aside. Place the chicken broth, beef broth, vegetable broth, diced onion, sliced celery, diced carrots,, basil, thyme, ground pepper and bay leaves into a large pot and bring to a boil over a medium high heat until the soup begins to boil. At this point lower the temperature and bring to a simmer. Have the soup simmer for 30 minutes. After the 30 minutes has elapsed add the meatballs and the endive to the soup and simmer for about 10 more minutes until the meatballs are cooked through and the endive is tender. At this point you will want to slowly pour the lightly beaten egg into the soup in a thin stream while stirring the soup in a circular motion to form thin strands of the egg. You will want to stir for about 1 minute. At this point your soup is done. Use the freshly grated parmesan cheese as a garnish when you pour the soup into the bowls.